Dr. Douglas Hedwig has had a distinguished, multifaceted career as a conductor, professor, scholar, administrator, music critic and as a world-class trumpeter. Since 2010 he has focused primarily on composition, with works published by Carl Fischer Music and TNR Music. His most recent compositions have been performed at the Blossom Music Festival, home of the Cleveland Orchestra, the West Point Band, Chestnut Brass Company and at New Music on the Bayou (LA). He was commissioned by the Chattanooga Symphony Orchestra (TN) to compose a multi-movement work for string quintet, Movable Borders, which received its premiere performance in February 2017. 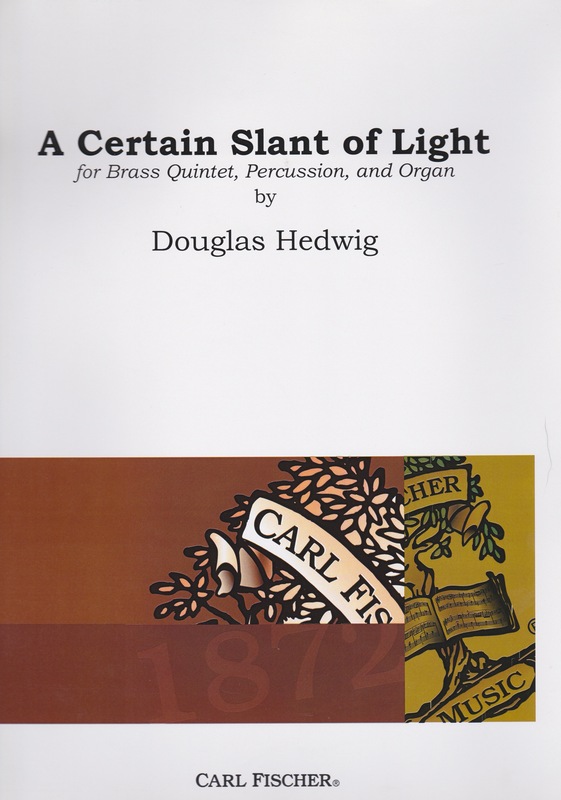 A Certain Slant of Light was commissioned and premiered by St. Paul's Episcopal Church, in Chattanooga, Tennessee. It is divided into five movements with the following titles: I. Heavenly Hurt, II. Internal Difference, III. Landscape Listens, IV. Shadows Hold Their Breath, V. Illumination. The composer supplied the following notes: A Certain Slant of Light was inspired by Emily Dickinson’s poem, “There’s a Certain Slant of Light.” First published in an edited version in 1890, the poem, written in 1861, was not published in its original version until 1955. Although certainly not a literal rendering, the work borrows the titles of the first four movements from the poem - “Heavenly Hurt,” “Internal Difference,” “Shadows Hold Their Breath,” “Landscape Listens” - which may give the listener an emotional orientation to the music. The fifth and final movement, “Illumination,” more closely reflects the composer’s own impressions and sense of hope, understanding, and newfound strength after confronting and dealing with turmoil and adversity. There are several musical themes which recur in various guises and forms within the piece. The opening movement, for instance, presents the primary theme of the work in a brass trio, which is a 4-note motive based on the rhythm and phrasing of the word “Alleluia.” As well, there are allusions to other church-related idioms such as the phrase “spiritu sancto,” a 5-note motif comprising a triplet + a duplet, in the fourth movement. Generally, the music moves from darkness into light, with occasional moments of reflection and struggle along the way as the drama unfolds. The musical language combines elements of traditional melody and tonality with atonality, minimalism, and even hints of jazz. The Dickinson poem is highly dramatic but often quite enigmatic with extended metaphors. The music focuses on the dramatic and pictorial aspects of the lines of poetry that are quoted, much as a romantic era tone poem often uses literary illusions. The great variety of tonal colors available in this ensemble are used to full advantage as are a multitude of musical styles and compositional practices, all to underscore the composer’s interpretation of the lines of text. This is a thoughtful, serious, well-constructed, imaginatively scored work meant for professional level musicians, although certainly within reach of advanced university/conservatory students. It is scored for trumpets in C, horn, tenor trombone, bass trombone (opt Tuba), one percussionist alternating on chimes, timpani, vibraphone, suspended cymbal, and organ. In a note to performers the composer states: “This composition is a rather unique, serious concert work - though still very audience accessible - and very different from the standard brass and organ literature that is largely focused on transcriptions and ceremonial music of various kinds.” Layout and printing are first class. There is a recording of the work on Dr. Hedwig’s site: http://www.douglashedwig.com.